Swim in the translucent waters of Istria’s Pomer Bay at the Arena Pomer campsite without worrying about pitching your tent or starting a fire for food. The campsite provides wooden lodges and safari tents that can house up to six people; it is also equipped with Wi-Fi, speakers and a coffee machine. You can spend your time windsurfing, hitting one of the many bike trails or relaxing in a sauna. Mali Lošinj—the largest town amid Croatia’s beautiful island cluster is camp Cikat that offers travellers an amazing piece of outdoorsy heaven. Apart from swimming in the clear waters of the sea, you can go trekking in the thick pine forest or take your kids to the Pepë family park for fun activities. en-suite bathroom. Guests can enjoy outdoor BBQs or flex their muscles at their in-house playground. Adventure aficionados can rent bikes to tour the area or go snorkelling with an instructor. Another campsite in southern Istria, the Bi Village near the National Park on the Brijuni Island welcomes you to a thick forest cover overlooking the beach. Jungle hikes in the morning followed by dancing at the disco in the evening—this place has many activities to keep you hooked. There are also super markets and shops for when you want to go strolling around the neighbourhood and also a salon to pamper yourself! This perfect summer getaway is situated on the Lanterna peninsula with stunning sandy and pebble beaches stretching along the 2.5 km long coast. You can even take your pooch as this is a pet-friendly resort. A buffet, a tennis court and activities like canoeing will make you wish you could stay there longer. Fancy a bistro or a cocktail bar at the beach? This is one of the many perks while camping at Ježevac Premium Camping Resort in the ancient town of Krk. You can lounge at the family or adult beach and get plenty of open air massages here too. The many pebble beaches here offer plenty of recreational activities for all age groups. For accommodation, you can choose from a pitches under the pine trees or the more luxurious camping homes that have their own little gardens attached. A well-organized campsite like Camp Simuni at the picturesque Pag Island, near the small fishing village of Šimun can make a vacation special. Here you can choose from nine different camping accommodations. As a pet-friendly and disabled friendly area, it ensure a genuine camping experience for all. Fun-filled activities like diving, sailing or visiting the Aquapark will keep you busy. In the summer, you can pick fruits from the thick vegetation at the beach and enjoy spectacular fireworks. 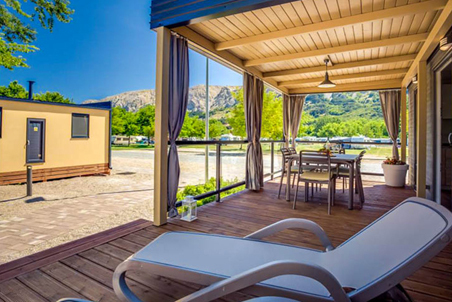 This is perhaps one of Croatia’s best campsites —located at the mouth of the beautiful River Cetina in the Omiš region. You can rent a own mobile home and explore the wilderness on your own. There are ziplines and rock climbing areas for thrill seekers. Rafting on the Cetina is also open in the summer. Indoor recreation facilities include tennis courts with flood lights, an artificial turf football field, and basketball, volleyball and handball courts.